In Knesset session, Temple groups demanded to know if Jews would be allowed onto the Mount during the high holidays. The government did not send a representative to a Knesset debate Sunday regarding its policies on the Temple Mount, leaving MKs and Temple activists in the dark about the way it intends to handle Jewish groups that seek to enter the Mount during the high holidays. The debate was held in the Knesset's Committee for the Interior and Environmental Protection, which is headed by MK Miri Regev (Likud). The session's planners had hoped to hear the government's position regarding Jewish pilgrimage to the Mount on the high holidays, along with explanations as to why Jews were prevented from entering the Mount during the majority of the Muslim holy month of Ramadan. 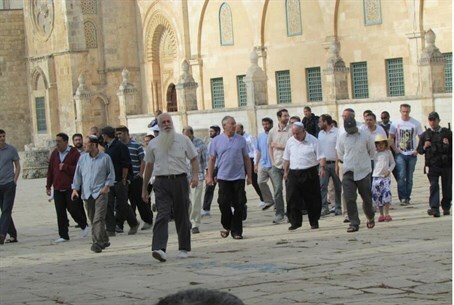 The debate was kicked off by Yehuda Glick, Chairman of the Fund for Temple Mount and Temple Heritage, who described the visits to the Temple Mount by Jewish groups during Ramadan, saying that Muslim groups shouted “racist and insulting” epithets at the Jews. He added that Jews were barred from entering the Mount for a full 21 days and not just during the Eid al-Fitr period, as was the case in previous years. Glick expressed his concern that police are not preparing themselves adequately for the entry of a large number of Jews to the Mount during the high holiday season in the Hebrew month of Tishrei (which more or less coincides with September this year). MKs Nissim Ze'ev (Shas), Orit Struk (Bayit Yehudi) and David Tzur (Hatnua) agreed that the Prime Minister's Office is the body in charge of policy on ascent to the Temple Mount, and that it must present and clarify this policy. Col. Moshe Bareket, Commander of the Israel Police's David Precinct, which includes the Mount, denied that policy regarding the entrance of Jews to the Mount during Ramadan had changed, in comparison to previous years. In the last two years, he said, the government's policy has been to ease the entry of Muslims during Ramadan, and this has led to an increase in the number of Muslims who do so – reaching hundreds of thousands on Fridays, and tens of thousands on weekdays. He said that police are making intensive efforts to make sure that Jews are allowed to ascend to the Mount during the holidays without limitations. MK Dov Khanin (Hadash) said that the police were justified in blocking Jews from entering the Mount since the status quo is that Jews pray at the Kotel and Muslims pray on the Mount. Breaking the status quo could damage the diplomatic process with the Palestinian Authority, he added. MK Tamar Zendberg (Meretz) said that freedom of worship for all religions must be granted, and that this freedom stems from a belief in human rights. She said that encouraging the "peace process” will lead to a desireable result. MK Regev concluded the debate by officially protesting the government's decision not to show up at the debate, and asking that it rethink this decision by the next time the committee convenes to discuss the subject. Despite its supreme importance to Jews worldwide, Jewish visitors are subject to draconian restrictions on the Mount, including a ban on praying, due to the presence of an Islamic complex, administered by the Waqf Islamic Trust, and amid threats by Islamist groups. The Israeli police have bypassed several court decisions upholding the Jewish right to prayer there by citing unspecified "security concerns", either to ban individual activists or even to issue blanket prohibitions on Jews ascending at all. Religious Jews are followed closely by Israeli police and Waqf guards to prevent them from praying, or from carrying out any other religious rituals. Non-Jewish visitors are not subject to such restrictions. Last week, Jewish activists protested the ongoing restrictions, which have also been criticized by several MKs and government ministers.